I actually managed to watch "Up in the Air" the other day, and never truly realized how your can forge such a happy little existence for yourself on the road, away from all the stresses and strains of real life. Anyways, we digress...when last we left Infosys BPO COO, Ritesh Idnani, in Part II, he was expounding on the shifting BPO landscape, with the increased need for providers to develop their expertise in vertical industries. In our final part, Ritesh elaborates on communication and interaction, and how our industry can rapidly improve collaboration through social media. Phil Fersht: You mentioned social media impacting things quite considerably. How do you see that impacting our industry - and how is Infosys leveraging it? Do you also see social media presence and expertise becoming increasingly important when servicing your clients? There is a different order of opportunity and dynamics presenting itself today, that is very different than what all of us might have experienced. I think these are the contextual issues that need to be articulated for every individual client and their environment to see what is relevant. These are what we are building into a lot of our offerings on the social media side. What we have also done, from an internal context is that we encourage the use of social media in a manner that is pertinent and relevant. Today not only our leaders contribute to blogs, , but we also encourage domain experts and functional leaders who have a point of view on the industry to go out there and express their point of views. A lot of Infosys opinions and views are today available on the World Wide Web. You may find some very interesting examples not only on our own site but also on industry sites where opinion leaders congregate. I think the second piece of it is where a lot of us at the unit leadership level end up doing chat sessions with people in the organization because we thought that it was important to address a lot of the queries that might come up and a lot of the Gen Y population is very conversant and comfortable with chat and other such media as a way of communication. We are also using mechanisms whereby we are asking questions and then soliciting responses to those specific questions and using that as a way to see if we get some ideas that by which we can drive business. We use social media on the floors, on the BPO side, to solicit the best ideas that are there that might come from a process associate. Our belief is that some of the best ideas come from the associates on the floor and it’s important to channel that in the right way and social media is one way to do that. So that is a very practical use of how we are trying to generate opportunities that benefit our clients and their business as well. These give you a sense of what we are trying to do both from an internal and external perspective and for clients and for our employees. Phil: It’s been a personal observation of mine that Infosys is a very open company with its clients and the way that it interacts with the industry. Its refreshing seeing how you engage so openly with everybody at your client events - it really encourages people to talk about their issues, and how to get better at global sourcing. Can you see Infosys at some point leveraging social media channels to have some of your clients interact across client lines? Is that something you can see happening in the near future? Ritesh: Oh, absolutely. One of the things that we ended up doing is actually launching a BPO community--Colloquium Online. The idea behind that is to actually get clients to leverage social media to interact with each other and enhance peer - sharing of business and industry best practices in an unfiltered and un-doctored environment. I think there are about 45 client organizations who have signed up to that, who are already leveraging the community to interact and see to each other on various topics of issues. We initiate a few of these topic issues but thereafter, it is really the personal interactions that these clients are having with each other and we have just facilitated the same. We do believe that open dialogue is the best way for us to further sharing. The knowledge sharing and resultant industry insights have opened great opportunities to understand businesses up close. It is also a way to actually ensure that innovations that might be there in one particular sector, is something that can be taken to other industries in a manner that’s most relevant. So we are actually all for it because it allows everyone in the industry to benefit. So the good, the bad and the ugly is actually good. It’s good for our clients and prospects alike. Another thing that we are doing is we are trying to form industry specific councils. The newspaper sector is a good example of that. We are getting all the newspapers together to share practices around what they are seeing in their sector. The newspaper sector, particularly in the US, doesn’t compete with each other in their markets and therefore they are more than happy to share information as it pertains to their company. You end up having a very open, honest and frank dialogue on what works and what doesn’t work because everyone is grappling on the issues and not just on the cost side. They are also asking, “How do I actually ensure that my business model is going to survive long term?” So those are the second kind of forums that we are trying to put in place for people that meet at regular intervals. We essentially just provide an outlet and thought leadership on a few ideas. Thereafter, it’s really up to them to share what practices are there. Infosys is also going to co-create assets that are relevant for a particular industry sector. So that’s a third kind of intervention that’s out there in the market place that we are trying to do. Phil: When we look at where things are moving today, and the speed with which things have changed in the industry, what advice would you give to some of the younger practitioners who are involved in sourcing whether on the buy side or sell side? How should they look to develop their careers in our business today? Ritesh: One of the key messages that I end up telling a lot of folks, whether it’s on the buy or the sell side, is, “Don’t necessarily go for more.” It’s not necessarily about how many people report to you, how much revenue you control, or what kind of business impact you are able to drive especially in the formative years in one’s career. It is really a question of what kind of skill sets you are able to get. Often times, those come not necessarily through what I call vertical growth, which is really more of the same, but it comes through horizontal movements which is moving laterally and picking up a lot of skill sets over a period in time. I think the second thing I would say is it does help to have actually people pick one vertical or one functional area from an expertise standpoint because I think that is always useful to go back on and that is something that people should think about. I think that the third piece of it is everyone needs to always be in a situation where they can’t just end up being aggregators of information but keep looking for learning opportunities. No matter how high you go up in the organization, you cannot get away from that. So I think that’s something that I would encourage people constantly in their careers to keep learning along the way, forget the fact that they have reached to a certain level. They need to not get away from the detail yet focus on what’s strategic. And last but not the least, I have been very fortunate to have had a number of good mentors throughout my career and a balance between my professional life and family life that has worked for me. They have taught me how to develop strong teams, how to stay laser-focused on managing and growing a business, given me a global perspective, and made sure that I stay focused and disciplined on the objectives of whatever business I have run. Also, these folks have been an invaluable sounding board for my ideas, which is critical in thinking through complex business issues. Having mentors or a team with whom you can discuss ideas and who you know will provide unemotional input is key. You do not always need to follow the advice but it is a big mistake if you do not ask for help. Phil: So finally, Ritesh, I hear from several of your colleagues that you are the most traveled executive in Infosys.. So would you encourage everyone else to do that? Ritesh: I think for me it is extremely critical on two fronts, being in front of both my customers and the employees. I think being in front of customers at various points in time is extremely critical to get a pulse of the market and to know where our clients are headed. I think that’s the reason why I like to do this travel at times but I like to travel and meet customers at different stages of the life cycle if you will. I think that traveling to see employees is critical purely because it is important from their standpoint because they might be in locations that are at far flung spots globally. They need to know what other kinds of opportunities are there, what are the different kinds of things that are happening in the company, what should they be looking forward to, and also some of the key measures that you want them to focus on as well. I think that’s useful and extremely important. I think it helps the cause of the organization and certainly helps to build many more touch points with both customers and employees. The key message is it is important to be in front of your customers and employees and whether travel is an essential part of that or not is a secondary question. Phil: Ritesh, on behalf of HfS and our readers, I would like to thank you for your time and look forward very much to hearing more from with you folks again very soon. 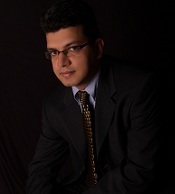 Ritesh Idnani (pictured) is COO for Infosys BPO. During his time with the firm, the BPO business for Infosys has scaled ten-fold from a $40m business in 2005 to a $400m+ business in 2010 (the forecast is for Infosys to report revenues anywhere between $405m-$420m by end of current fiscal). He has led two of Infosys's largest acquisitions in the last 4 years, McCamish Systems, a leading provider of life, annuity and retirement services products in 2009, and the shared service centers of Philips in 2007. 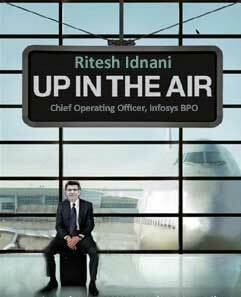 Prior to Infosys, Ritesh held exec roles with PwC and Citigroup. He lives in Basking Ridge NJ with his wife and twin boys. Thanks for a great discussion, Ritesh and Phil. The points about social media and client collaboration are getting increasingly important - those suppliers who can help facilitate this can develop roles as "collabooration hubs" for their clients. Who was it who said you have to collaborate to innovate? Super interview - thanks Ritesh!